Throwing a successful Super Bowl bash doesn’t have to be expensive or time consuming. Dips, snacks and more tips for your Super Bowl party will have people returning each year for your awesome bash. Think about having a nice spread of dips, various snacks that can go with them, a big pot of chili, add a couptale signature dishes, and you’re on your way. Add some treats and cocktails and everyone will be in the mood to celebrate. If you aren’t really sure where to begin, here are some tips from the Home Wizards. A Crockpot of Chili Will Warm the Crowd! Not only does chili fill you up, but it’s inexpensive and a little goes a long way. A crock pot of chili could be the cheapest item on the Super Bowl menu. Now strategically place some chips, shredded cheese, and potato skins right by the pot and you have all the fixings for a meal. Also, chili can be vegetarian or with meat. USA Today’s article Recipes: Super Bowl Party has a couple of great recipes for both veggie and hearty meat chili options. No Super Bowl party is complete without a great spread of dips. Again this doesn’t have to be expensive. Try a spicy queso – always a football fave – or how about a warm artichoke dip or blue cheese ranch option. Another fun idea is to fill some mason jars with jelly beans in team colors or any combination of colored candy that works. Then label a jar for the home team and for the opponent. Make it a fun rivalry conversation piece as well as a sweet treat. 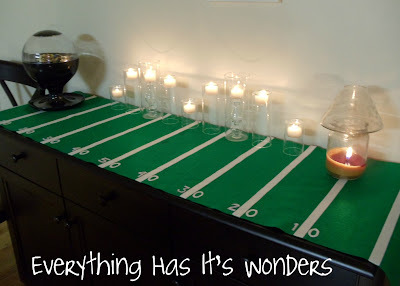 Now you need classic football party table décor to put everything on – but how do you do it? Make a table top liner made of faux/artificial grass which you can get at a big box store. It’s cheap and adds to the fun football theme. Use white first aid tape to set the yard lines. Voila, you have a football field! Take a look at this picture at the blog-site, Everything Has Its Wonders – it’s an interesting twist on the idea.